The last decade has seen a renaissance in the popularity of several once-unloved plants. Dahlias, chrysanthemums, even gladioli, once-upon-a-time the subject of disdain and neglect, and are all now grown in the chicest gardens. Fuchsias, though, have not yet made it back into the limelight. They are still seen as belonging to a world of dolly-tubs and back-yards rather than the world of elegant old-rectory gardens or urban patios. 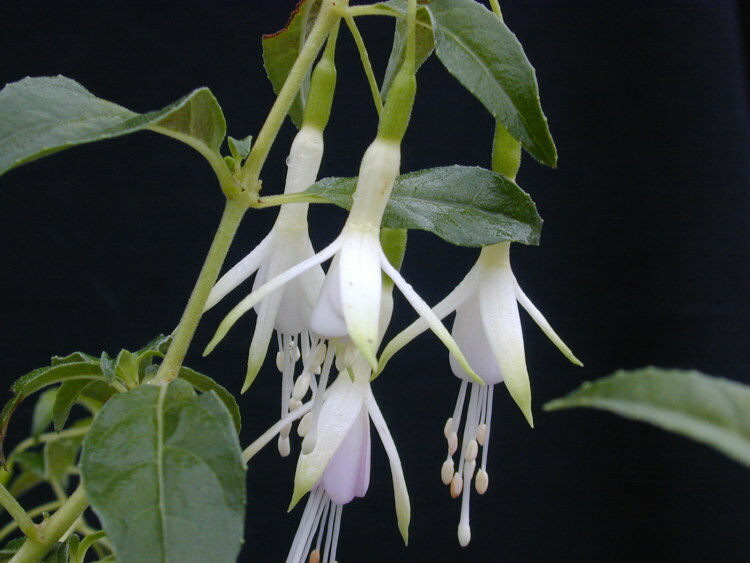 Fuchsias are easy to grow, long flowering, floriferous and colourful. What more could we demand of a plant? It would seem that for many gardeners they are too colourful. And the shape of the flower doesn’t help. The most provocative consist of a dozen scrunched-up petals surrounded by sepals of a violently contrasting colour. These, like most fuchsias, have been bred for the lucrative summer-bedding market and for the show bench, where big and bold are in demand. If the pirouetting ballerina flowers make you squeamish then look at the Fuchsia triphylla hybrids. These have flowers with long, narrow tubes in shades of pink, salmon and orange.. They tend to be compact plants, usually around 50cm tall with dark foliage. The most commonly-seen is ‘Thalia’, a vigorous cultivar with orange-red flowers. ‘Koralle’ has paler flowers and will grow in shade. F. triphylla are very susceptible to cold and are usually treated as an annual. More robust are F. boliviana hybrids. The species itself has 6cm-long crimson flowers that are followed by dark red berries. By the end of summer a plant can reach a majestic 2m tall The white form F. boliviana ‘Alba’ has even longer flowers that are pale red at the tips of the petals. Both are very easy to grow from seed. 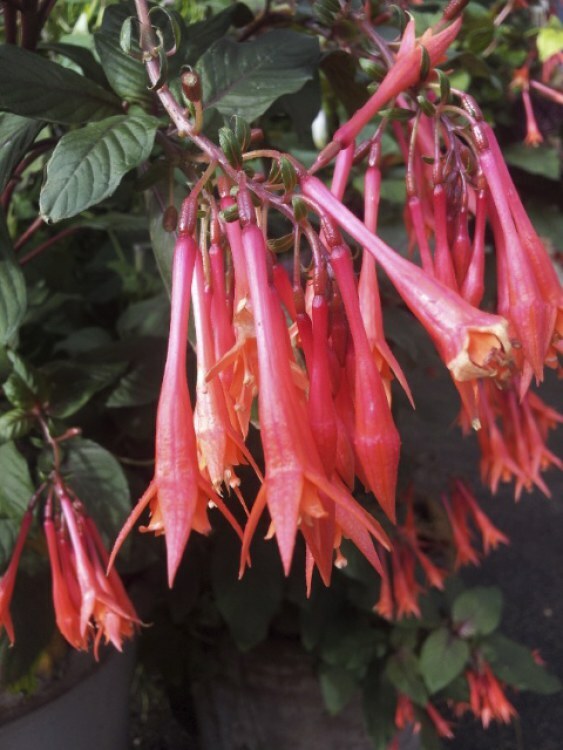 Fuchsias are native to Central and southern America, the West Indies and Mexico. In Britain they are most often seen in areas that are warmed by the Gulf stream where the small red tubular flowers of F. magellanica have become a familiar sight in hedgerows. Cultivars of F. magellanica are hardy on well-drained soil throughout the rest of Britain but will probably die back to the ground during the winter. If you don’t like the red and purple flowers of the species, F. ‘Hawkshead’ has small white flowers and F. magellanica ‘Sharpitor’ has pale pink flowers with white and green variegated foliage. Even if they are cut back each season, both will make plants about 1m tall and both will grow in shade. Not all Fuchsia have pendant flowers. F. arborescence has clusters of pale mauve flowers that resemble sprays of lilac. As its name suggests, in the wild it is a tree that grows to 6m tall but my plants have only ever reached 1m tall. Unusually, the flowers of F. procumbens face upwards and have startling blue pollen. Start growing them now, then when the revival does come you can be ahead of the pack. Unless you live in a very mild area, even so-called hardy fuchsias can be killed by cold weather, wet soil or drying winds during the winter. Planting with the base of the stem a few centimetres below the surface of the soil will help the plant survive: even if your plants are hit by frost they will usually produce new shoots from under the soil in spring. Many tender species will survive in a cold greenhouse if they are planted in this way. Most species Fuchsia grow quickly and easily from seed. Squash the ripe berries onto the surface of a sowing compost in the autumn, cover lightly and keep in a cold greenhouse over winter. Hybrids and cultivars can be grown from cuttings taken in late summer, but they will need bottom heat to get them trough the winter.